Party people! I hope everyone has had a great week. Mine has been mostly sweet with a touch of sour but I roll with the punches. This week’s OSF theme is Girl Groups. This was a rough one to narrow down! As I anxiously await Tuesday when Raphael Saadiq’s The Way I See Itdrops, I thought about giving ya’ll some Motown sounds. Maybe some Marvalettes, Supremes, or Martha Reeves and The Vandellas. Then I thought that since I’ve been in a sassy mood this week I should drop some Klymaxx, “The Men All Pause.” and “Meeting In the Ladies Room.” I play “The Men All Pause” is mood music when I’m headed out on a Saturday night. 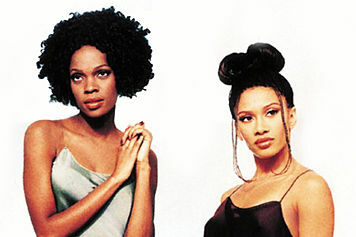 However, as I’ve mentioned, the 90s is my favorite decade in music in part because of the proliferation of girl groups. So many to choose from: Jade, Changing Faces, 702, En Vogue, XScape, Total, Blaque, and two of the best selling female groups of all time: TLC and SWV. And then there was Zhane. When I tell you I let my tape rock til my tape popped, I’m not exaggerating. My freshman year of college as I was getting over an unrequited love, I estimate Pronounced Jah-nay got about 8,873 spins and Mary’s My Life twice that (but that’s another post). They also won a hard fought spot on my Top Fifity Songs list. It wasn’t easy to choose just one from that album. “Love Me Today,” “Everything Happens For A Reason,” “Off My Mind,” and “La La La,” are my other favorites from that album. I guess I’ve covered the whole thing! These songs still bring back some very deep emotions even fourteen years later. That’s real music. However, I got to end it with their first hit, “Hey Mr. DJ,” the ultimate party starter. I dedicate this one on the “request line” to DJ YZO of Industry Soul.You’re the greatest mannnnnn! Both Jean Baylor and Renee Neufville are both enjoying solo careers. Jean’s album Testimony: My Life Story is available for download on her website. I think I am going to cop that! Renee performs with Roy Hargrove’s RH Factor. Check out her You Tube channel for some outstanding live performances. and Check out some of her new music that will presumably be on her album, Sovereign whenever it’s released. I will get my hands on that as well. She sounds great with RH Factor. Party is not over. Be sure to visit the other OSF participants. I’ll be honest, I’m not familiar with Zhane or alot of the other 90s girl groups (except En Vogue, TLC and SWV). Nice song picks tho … think I may have to hunt down the Zhane album! Think one of my favourites has to be Total. A friend ‘borrowed’ my copy of Kim,Keisha,Pam and never returned it, so thinking thats ANOTHER album to add to my (very long) list! Hey DJ keep playin that song…. Great choices! Got me dancing and grooving over here. Happy OSF! Awesome picks! Someone else also posted Zhane! I loved their voices! i did the ‘zhane’ thing this week too (of course you know this). i can’t say that i had ever heard of the first song because the song that i picked is my favorite by the group, but i believe that everyone knows about the second song. Zhani was pretty good, I have to admit. They have very melodic voices I recall. I am trying to think of something nice to say, but I was just one of those folks who really didn’t care for Zhane. I think it had more to do with the fact it was on the radio so much I thought the DJs were getting payola. Anyway, Happy OSF. Zhane’s debut cd was one of the 90’s finest for sure! thanks for spotlighting them. i’m re-downloading the cd as i type this because when my itunes library crashed earlier this year i lost it. i had it in a special sunday soundtrack playlist. going to recreate it as soon as the download is done. I am so glad that (almost!) everyone loves Zhane like I do and enjoyed this tribute to real sanggggin.